London, the capital of the United Kingdom, is a leading global city with cultural diversity. It is a city of festivities and people living here like to enjoy their life, success and holidays with parties and functions. So the demand for catering service in London is increasing day by day. If you have a passion for food, love to cook, have an entrepreneurial streak and want to take your career in a new direction then starting a catering business in London could be the perfect fit for you. Have you ever been to a wedding reception, business meetings or hospitality events? If so, then you must have noticed one thing in common, and that’s the array of food that always accompanies them. These foods are often provided by outside caterers. So, catering is the business of providing food service to different events. Apart from food service, a catering company also provides drinks, crockery, cutlery, glassware, decorations and serving staff. Make a Catalog: To start a catering business, first you have to make a list of items that you need. Inventory what you have and what equipment you'll need to purchase. For example, you may need a big dishwasher with a capacity of washing a lot of dishes at a time or you may need a separate freezer to store your foods. You will also need dishes to transport the food and ways to keep hot food hot. Find a Niche: This is a very important part of setting up a catering business. Look for a niche that your competition has overlooked or that you feel you can work on. As a small caterer, at first you might not have the capacity to cater a sit-down dinner for a wedding of 100 guests. But you can cater wedding showers, engagement parties, and bachelorette parties quite comfortably. It’s always better to work on your limit. Moreover, research what your competitors are offering and how they are operating their business. Apply those methods to your business if they are suitable for your business. Determine Your Food Menu: While choosing the menu, you have to be very careful because it can either make or break your business. So before deciding your menu, you can hold a taster session to decide what works well and what doesn’t, and ask for honest, constructive feedback. Then decide the menu according to the feedback. Establish Relations with Vendors: As stated before, sometimes caterers need to provide additional services like glassware, decorations even the tables and chairs at some events. So it is wiser to research the suppliers in your area and make a business agreement with them. Manage your Finance: To run a catering service in London, you might have to manage a strong capital. You may need to borrow money from a bank, so make a realistic financial plan. A bank would want to see a strong credit rating. A business that is well-structured and shows reliability has a higher percentage chance of getting a bank loan. Emphasize on Marketing: You must develop a marketing plan for your business. It will help you reach your potential customers. You can design business cards, make a few of your signature dishes and take photos for your website. You can also run a social media campaign for your business. A recent study by ZDNet shows that 74-80% of people between the ages of 29 and 69 use the Internet for product research. This means that if your business has no online appearance then you are more likely to lose two-third of your prospective customers. Food Business Registration: You have to apply for food business registration if you want to sell food in the UK. The process is free but you have to register at least 28 days before you plan on selling food or you can be imprisoned for up to 2 years if you’re caught selling food without registration. The Business Premises: They should be clean and in good condition with pest control, lighting, ventilation, lavatory, hand washing, and drainage facilities. Food Preparation Room: The room must have adequate facilities for washing food and equipment, storing food and removing waste. Moreover, the surface of the room must be easy to clean and disinfect. The Food Handlers: They must wear clean clothes and observe good personal hygiene. They should not smoke when preparing food. They must be provided adequate training on food hygiene. Medium of Transporting Food: Equipment and containers that are used for food transportation must be in good state of hygiene. Moreover, they should be redesigned so that they can be easily cleaned. Food Storage: Food and food waste should be stored in a closed-lid container. You also have to maintain different temperatures for dairy products, cooked products, and prepared ready-to-eat uncooked food. For this purpose, you may need refrigerated vehicles. Follow the processes that we have laid out in this guide and you’ll be sure to get off to the best possible start with your catering business in London. 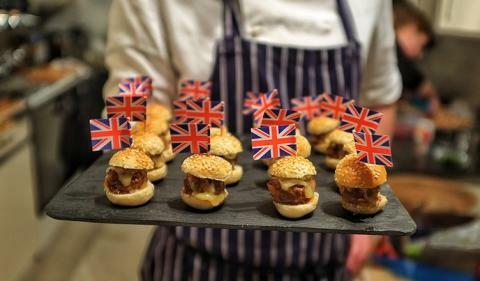 Furthermore, the demand for catering service in London is on the rise. So making a career out of catering service will be the right decision for you if you can execute everything accordingly.